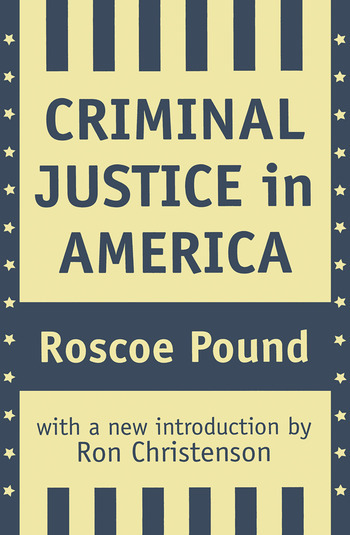 Roscoe Pound believed that unless the criminal justice system maintains stability while adapting to change, it will either fossilize or be subject to the whims of public opinion. In Criminal Justice in America, Pound recognizes the dangers law faces when it does not keep pace with societal change. When the home, neighborhood, and religion are no longer capable of social control, increased conflicts arise, laws proliferate, and new menaces wrought by technology, drugs, and juvenile delinquency flourish. Where Pound saw the influence of the motion pictures as part of the "multiplication of the agencies of menace," today we might cite television and the Internet. His point still holds true: The "old machinery" cannot meet the evolving needs of society. In Criminal Justice in America,Pound points out that one aspect of the criminal justice problem is a rigid mechanical approach that resists change. The other dimension of the problem is that change, when it comes, will result from the pressure of public opinion. Justice suffers when the public is moved by the oldest of public feelings, vengeance. This can result in citizens taking the law into their own hands--from tax evasion to mob lynchings--as well as in altering the judicial system--from sensationalizing trials to producing wrongful convictions. Ron Christenson, in his new introduction, discusses the evolution of Roscoe Pound's career and thought. Pound's theories on jurisprudence were remarkably prescient. They continue to gain resonance as crimes become more and more sensationalized by the media.Criminal Justice in America is a fascinating study that should be read by legal scholars and professionals, sociologists, political theorists, and philosophers.